Into the Mound: Witchcraft Again – reply to Raven. Raven commented on one of my witchcraft posts, and he makes some objections that I keep trying to clarify to myself. I’ve been interested in the current wave of ‘Traditional Witchcraft', which has been gaining steam over the past 20 years or so. I’ve just finished a round of reading including Oates, Howard, and ‘John of Monmouth’. Fascinating stuff for history-of-occultism geeks, especially about the early 60s and the first seeds of public Paganism. None of it, however, changed my opinions in this article. I think you are overlooking the fact that many modern Traditional Witches do not consider themselves "Pagan," and some do not even consider what they do to be a religion. No, I’m questioning whether the term “Witch’ can accurately be applied to a magic user who isn’t working in a specific religious context. I’m generally opposed to using the term ‘witch’ as a synonym for ‘folk-magic user.’ Folk magic is a huge category in itself, encompassing every religious type, including the modern idea of having no religion but still working magic. I’m confident that the notion of magic without religion is a modern concept, one that I tend to dismiss as a new age error. My impression is that a huge percentage (so far as I know, all) of modern self-identified Traditional Witches have constructed their own practice from literary sources, sometimes with a cultural link to a previous generation of European-culture charmers or conjurers, but much more often without that. They’ve made it up themselves out of books, just as other Neopagans and speculative occultists do. When I see a modern Traditional Witchcraft practice that involves the worship of pre-Christian gods or spirits then I become almost certain that we are seeing a modern construct. I have yet to see convincing evidence of survival of pre-Christian worship into early modern times, especially not in northern or western Europe. So to me either an attempt to work magic with no religious context or to work it using Pagan deities marks a system as nouveau. Those who work magic using the dominant paradigm of cultural myth and ritual, usually Christian or Muslim though there are Hindu examples too, don’t usually like to have the term ‘witch’ applied to them, or at least they didn’t before Gardner. To the extent that traditional practitioners might use the word now I’d suspect they rely on the good will that Neopagans have built for the term to let them use it with impunity. 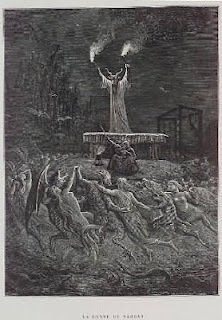 Most of the ones I know of do indeed draw from the well of Judeo-Christian folk magic, the various grimoires (which were also used by the Cunning Folk, and which do indeed contain references to summoning the spirits of the dead) and other forms of traditional folk magic. Yes, the cunning arte *is* traditional folk magic, with plenty of crossover from the literate elite magical tradition. However, since I think the term ‘witch’ should be reserved for a non-Christian religious position (whether Pagan or diabolical), and since the cunning-folk themselves would have refused the word, I don’t use ‘witch’ to refer to cunning men such as Arthur Gauntlet. Obviously cunning men like Gauntlet would have drawn their magical power from their relationship with ‘God’ and Jesus and the saints. They were not ‘witches’ by any definition except the unacceptably broad one of the Church: ‘anyone who uses magic.’ Again, that’s not a good definition for ‘witch’ if our goal is to have a reasonably technical vocabulary that practitioners can use to communicate. In my mind, saying Traditional Witchcraft is "NeoPaganism" is like saying Hoodoo is "NeoPagan" merely because it's suddenly become popular. ‘Traditional Witchcraft’ does not mean ‘European folk magic’. Most folk magic isn’t witchcraft in any sense except in the sense of Church doctrine. 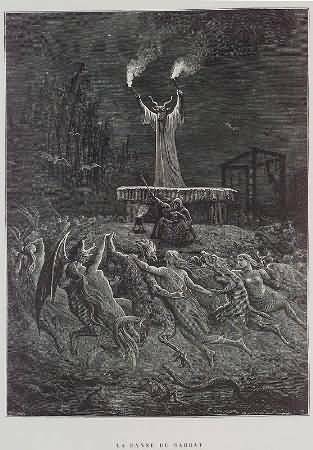 ‘Witchcraft’, if the word is to make any sense, refers either to the survivals of pre-Christian European magico-religious practices or to the diabolical cults first imagined by the church and later imitated by occultists. Hoodoo is a body of magical technique that can be applied inside any number of religious models. It isn’t a system in itself, really, so much as a body of method used inside a system. For most of southern conjure that system is Protestant Christianity, though there are Catholic versions and re-Africanized ones as well. Now, of course, there is lots of hoodoo tech being applied in Neopagan religious contexts. That's entirely reasonable since lots of hoodoo practice does come from Europe. European folk magic (itself one of the sources of hoodoo) is likewise a body of technique that migrates from religion to religion over the ages. Originating in Pre-Christian, ‘Pagan’ Europe it includes plenty of material ‘leaked’ from the literate magical tradition. By the 18th century, with rising literacy, the popular publishing of the grimoires led to an even closer joining between folk and literate traditions. European magic has been taken up by the various Neopaganisms, starting with the Golden Dawn, leading eventually into the invention of self-described ‘witchcraft’ in the 20th century. I view Cochrane as at least as much an inventor as Gardener, and consider modern, self-defined Traditional Witchcraft in the English-speaking world to be a 20th century reconstruction. There are almost certainly real traditional folk-magic users and sellers in business. I doubt that they call themselves witches. People who call themselves witches (in English) are basically modern reconstructors. My assumption, again, is that practices such as Tapping the Bone, the Compass Round, Hedgecrossing, and skull-necromancy are modern reconstructions based on literary sources and personal inspiration. I consider them juicy reconstructions, incidentally, much closer to the spirit of world magical practice than post-masonic style rites. ...However, it is clear to me most modern Trad Craft draws from the same well that European Witchcraft has always drawn from, which to my mind makes it an authentic historic practice (practice, not "Pagan religion") that in many ways is incompatible with modern NeoPaganism. If it isn’t religion (or mystery spirituality, if you think there’s a difference – I don’t), it isn’t witchcraft, in my opinion - it is magic. On the internet people have the ability to refer to themselves as whatever they please, and I’m not interested in quibbling over individual cases. In general I prefer words to have set meanings, and I prefer not to multiply entities needlessly. Thus, I like the term ‘witchcraft’ to refer to a specific category of magic. A look at its historical usage seems to plainly align it with magic among pagan remnants practiced during the rule of the Church, and later with those who renounced the mandated religion in favor of another, more ‘Satanic’ one (by whatever theological measure). There are lots of good words for ‘general magic user’ out there; sorcerer, mage, conjuror, spiritual worker. I’d like to find an actual niche for ‘witch’ (sorry) that might clarify more than confuse. That said, let me be clear that I like the Traditional Witchcraft style of reconstruction. It certainly resonates with me more than does post-Cunningham public easy-does-it Wicca, and really even more so than BTW, post-Gardnerian style witchcraft. I think that the Trad Crafters’ diligent research into the actual magical practices of the past is paying off. I just think that the efforts made to connect existing Trad Craft practice (as it is visible to a relative outsider) with any organized sects or lineages of European folk-magic before the early 20th century are unconvincing. Every wave of Neopagan reconstructors has drawn on the best scholarship available to them in their age. Mathers’ understanding of Graeco-Egyptian magic was based on the newest material, freshly revealed, and now outdated. Gardner’s reliance on Murray was in line with the best scholastic opinion of his age. Cochrane’s reliance on Graves is perhaps less excusable, but Graves was certainly popular at the time. The entire first two-thirds of the century relied on Frazier, who is now mainly set aside. Modern Trad Crafters are reconstructing usable systems for themselves using today’s scholarship into early modern magic and folklore, non-European models of spiritism, and the Grimoire tradition. I admire the effort. If I wasn’t all bound in with this Gaelic thing I’d likely be in it myself ; ) (or maybe it would have been ATR…). You've definitely made some valid points, and to be honest, I forgot I'd ever commented on the subject! It sounds like I posted on rather a bad day, so hopefully I didn't come across as too strident. I will agree that the Cunning Folk did not refer to themselves as "Witches," though that is what most would probably call them using the modern definition of the word (and, indeed, "witch" is how how many contemporary sources referred to them.) I must also point out that I do in fact know modern Traditional Witches who operate in a somewhat Judeo-Christian framework and who do not venerate Pagan Gods. Such people have no problem using traditional European folk magic, prayers to the saints, etc as part of their witchcraft. I would not call them "diabolists", but most of these have a decidedly Luciferian slant to their work, or else work with what they call "the Devil" (though it is clear in talking with them that this is not Satan.) It's not an ancient, pre-Christian religion but it does show Pagan influences in that in some of the spells it's clear where saints, the trinity, etc were added at a later date in place of the old Gods. Hopefully this clears up my position a wee bit! You state: I’m confident that the notion of magic without religion is a modern concept, one that I tend to dismiss as a new age error. I will disagree with you Ian on that one. I have been practicing magic without any specific Religion; I think you confuse Religion with belief system. And I would add, it is better with the Celtic system since we do not know very much about their actual Religious practices. Like I said on the FB page of ADF,” it is my opinion that you do not need Religion to practice magic, what you do need is a belief system from which you formulate your spirituality”.